@oski Firstly, what? Secondly I'm talking about cubing a full set at once not a piece at a time. oski89 wrote: part of set give one su yeah?? set chain gloves = su chain gloves?? right? Mirtazapin wrote: what is a chaos runeword? Some OP runewords only viable in Chaos Ladder. so, they are the realm only rw´s like "the creep"? where can i get information on those? nice, thank you. if i only go on items-tab or runewords, they dont show up. Marco wrote: I think most people understood what this season was about. If you check his build he went with Tree Warden. Which Trees were super op this ladder. I made one myself about 2 weeks ago and it was more op then my pounce pally and survived a lot better. Will there be any changes to character skills or are the changes only to items? Regardless looking forward to next season. How do you "check his build"? 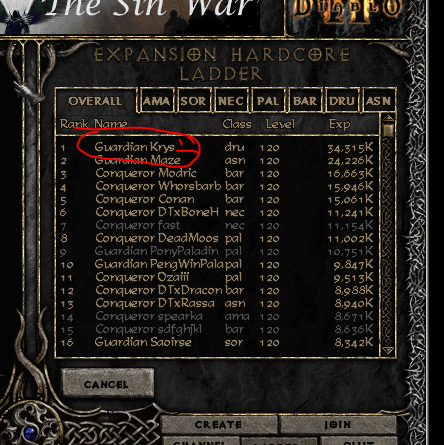 Also, the rune words cannot be made in non-ladder i assume then? It will show you all his/her skills and how many points he/she has into them. server only Patch, no download.